“A bit of music in the garden” takes on another dimension in the Viennese summer. 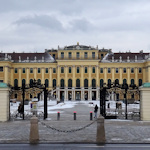 The “music” is a live performance by the Vienna Philharmonic Orchestra, and the “garden” is the landscaped park of Schönbrunn Palace, a UNESCO World Heritage site. Welcome to the annual Summer Night Concert. Vienna has a habit of throwing up beautiful settings for unique events. The Summer Night Concert (“Sommernachtskonzert” in German) is a prime example. Each year, the Wiener Philharmoniker gives a free open-air performance in the Schönbrunn Palace park gardens. The tradition began in 2004 as a “concert for Europe”, conducted by none other than Bobby McFerrin, and has since gone global: the event is broadcast around the world. The programme usually features more accessible classical pieces, with the occasional surprise: perhaps my favourite moment was a rendition of the Imperial March from Star Wars (better known as the Darth Vader music). The 2019 programme runs under the title “Rhapsody in Blue”, where Johann Strauss and Anton Dvorak rub shoulders with the likes of Leonard Bernstein and Max Steiner. The soloist on George Gershwin’s “Rhapsody in Blue” is Chinese pianist, Yuja Wang. She’s no stranger to Vienna, either, having played Rachmaninoff and Prokofiev at the Musikverein in 2018. Wang will also give a cycle of concerts at the Konzerthaus across the first half of 2019. Nor is Wang unfamiliar with the orchestra and palace settings, having performed with the Vienna Philharmonic at Versailles in late 2018. Entry is free and requires no ticket, with admission on a first come – first served basis. The park gates close once the park reaches full capacity (about 100,000), plus the earlier you arrive, the better view you’ll get. Directions for the palace are here. Access to the concert site is only from the northeast and northwest ends of the park, via the so-called Meidlinger and Hietzinger gates. If using public transport, take the U4 subway line to either Schönbrunn station (close to the Meidlinger gate entrance) or Hietzing station (close to the, um, Hietzinger gate entrance).